Check Latest Customer Reviews & Ratings on Amazon.com, Now! Among many electric pressure washers available in the market, it is difficult to find out the best or the most suitable one for your residential use. When your budget comes in front most of the time you have to stay back from buying your desired product. Ivation 2200 PSI 1.8 GPM Electric Pressure Washer is one of the best in the market. It keeps your budget in mind and maintains all the best features available. 2200 PSI water pressure along with 1.8 GPM water flow is more than enough for most of the cleanings at home. It will help you to clean most of the tough dirt easily and it is very convenient to use. You will get different nozzles for different usage. The modern technology Total Stop System (TSS) will help minimize the risk and energy. The machine is very easily movable with its two wheels. The storage makes the device compact. For residential use, IVA-9175L is an ideal machine which has been used in the device for its best performance. The machine has 14.5-amp, a 1600-watt motor. It produces 2200 PSI of water pressure and 1.8 GPM of water flow. The performance you will get will be the best for using at your home. Ivation 2200 PSI 1.8 GPM Electric Pressure Washer has the modern technology Total Stop System (TSS). It provides your motor’s safety and saves your valuable energy. The device gives you 5 interchangeable nozzles and a Turbo Wand for cleaning different surfaces effectively. With the unique copper connection, you can easily and quickly join the hose. The poser cord has a GFCI plug and its length is 30 foot for your convenient use while cleaning. The high-pressure hose is 20 foot long and the diameter is 0.5 inches. For 2200 PSI water pressure and 1.8 GPM water flow the hose that comes with the device is an ideal instrument. The machine has an integrated detergent tank to carry your detergent easily to your cleaning places. The dimension of the assembled device becomes 12 inches in depth, 11.5 inches in width and 29 inches in height. The device is 27.7 pounds in weight that has two strong wheels for its easy movement. Shop on Amazon with FREE Shipment! Read More Latest Customer Reviews! Good Quality Motor: One of the best quality motors has been used in Ivation 2200 PSI 1.8 GPM Electric Pressure Washer. The motor is ideal for residential use. To get an effective clean while cleaning your car, motorcycle, driveway, RV, fence and many more things 2200 PSI water pressure will be enough. You don’t have to worry while cleaning the tough dirt from your home. Total Stop System (TSS): This feature automatically shuts off the motor when the trigger is not engaged. It saves the energy and prolongs the device’ life. 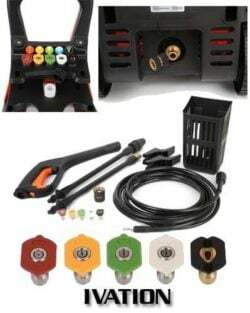 This feature that makes this device unique you will not get in most of the pressure washers available in the market. Integrated Detergent Tank: With most of the machine that doesn’t have a detergent tank, you need to carry a bucket for keeping your detergent. The integrated detergent tank of this device gives you relief from the carrying your detergent in some other container. Onboard Storage: The device has onboard storage for all its instruments such as cord, spray gun, hose, etc. The two wheels make it easier to carry it from one place to the other comfortably. The good length of the cord and the hose gives you a good stretch. You can clean your things outside your house easily. Warranty: With the device, the manufacturer provides one year of warranty to protect your investment. If the device has some problem the manufacturer is bound to fix it or change the parts. Some of the users have complained that sometimes it becomes difficult or long time to get the service for instrumental problems. So it is advisable to use the device by an expert for the first few times or follow the instructions given in the manual properly. Sometime it becomes difficult to keep the hose or the power cord in the storage properly as they become a little stiff after using. This is a minor problem considering all the facilities you are going to get out of it. There is a big difference between an electric pressure washer and a gasoline pressure washer. In general, an electric pressure washer contains less power than a gas pressure washer. Considering all the features and the facilities we can say that Ivation 2200 PSI 1.8 GPM Electric Pressure Washer is one of the best electric pressure washers available in the market. It produces pretty less noise than a gas run pressure washer that will not annoy you while you are using the device. If you have a limited budget and want the best pressure washer in the market than this can be your best option. It gives value to your money and stays as a faithful friend with you always. Click To Buy it Now on Amazon.com with FREE Shipment! 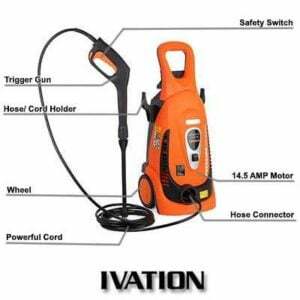 I purchased a ivnation 2200psi 1.8gpm pressure washer from amazon in early march .iva-9175l. I went to use it .today and it wont turn on. Is there any way to help me fix it? You can contact on Ivation official website. They will assist you for solving your problem. Don’t worry. Were they able to assist? How did you contact them? I have the same issue and don’t know how to contact them. Same thing happened to me. I have not contacted them yet. I was going to look for answers here. sounds like it is a real problem they have with this unit. Thanks for your comment. We tried to sort out the problem. There is only one solution that you have to contact the official team of Ivation. They will help you to solve your problem as soon as possible. We talk to them and they told us to talk to their help team. So, we suggest talking to their support team. If you have still any specific question, please feel free to ask us. I have the same problem, turned it on for the first time on 7/30/17 since purchased in Dec 2016. The motor turned on for 1 minute and would not turn back on again. I check the safety plug, still has a green light. Power button is on. Motor won’t come back on. Why? It can be the problem of your Motor which is not getting the power properly. If the motor doesn’t get electric power properly, it may make some problem. We think you should contact on Ivation official website or their customer service. They will solve your problem at free of cost if you have the warranty period. And why would we all not be getting power properly?! I have used this machine 2 times! I think it is a piece of crap and we should all contact BBB. Yes, Please contact their support team. They will help you to sort out the problem.